The latest milestones in the restoration of the Plaza Theatre have been covered in El Paso by producer Jeffrey Mills. Work continues on ornamental detailing, the rebuilding and enhancement of the annex building, and the completion of the new stagebox. 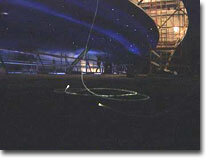 One of the most exciting developments is the installation of the new "stars" in the atmospheric ceiling. An updated system that uses fiber optic cable to create the illusion of twinkling stars in a night sky when the lights go down for a show is taking shape . Jeffrey captured crews installing and testing the celestial light show that also shares space with a new lighting grid and a modern sprinkler system. On July 12th, the Texas Historical Commission was on site to tour the theatre and review the work of historic preservation as crews return the facility to its former glory.